Our purpose is to discuss the value of cytogenetic data which are of importance to the clinician and pathologist in the diagnosis, prognosis, and classification of soft tissue tumors. It is well known that “accurate classification of a given tumor is often not easy, so much that acknowledged international experts are still unable to pin a label on about 10% of sarcomas” (Fletcher 1990). In this context, any new tumor marker is of paramount interest. 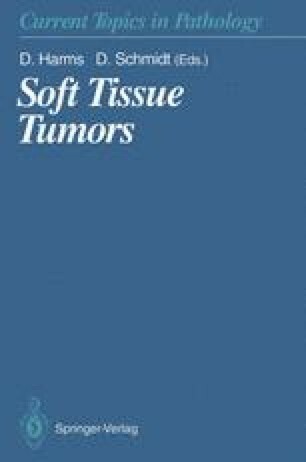 Cytogenetic data have already provided support for histological grouping within some soft tissue tumor types (Sandberg and Turc-Carel 1987; Molenaar et al. 1989; Fletcher et al. 1991). We will update the key cytogenetic data and give, when possible, molecular correlates, principally for peripheral primitive neuroectodermal tumor, adipose tissue tumor, rhabdomyosarcoma, and synovial sarcoma. But new data of potential importance are emerging on other soft tissue tumors, e.g., fibrohistiocytic tumors and clear cell sarcoma/malignant melanoma of the soft parts.